On Saturday, September 15 we are doing a demo in Ennismore and we need volunteers to sign up. So far only 7 people have signed up. We need at least 9 more people. Time will be 6-7:30pm. 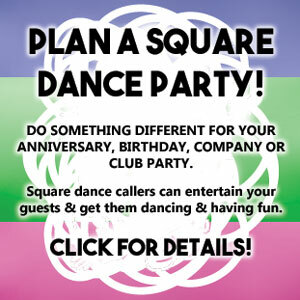 We hope to have two squares to demonstrate what square dancing is and then split up and invite the audience into the squares and Wayne will teach some basic moves. You can wear casual clothes or square dancing attire – your choice! PLEASE HELP! Ennismore demo will be lots of fun! We are available to go to the Ennismore Demo on the 15th if you still need a couple. We will be at Emmanuel Church tomorrow evening.